Trust me, I have been wanting to make egg tarts for a long time. What has been putting me off is the tart dough. Apparently, the flaky tart dough is not something that's easily attainable. Today however, I decided to give it a try using the leftover dough from yesterday pineapple tart dough. It may not be the right dough, but it was conveniently there, saving me time to make a fresh batch of dough. Besides, it is really wasteful to throw away some perfectly good dough. I adapted the filling recipe from my friend MY, with a few minor changes. 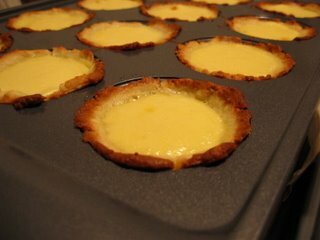 Unlike conventional egg tarts, I used my muffin pan, and didn't roll out the dough as listed in the recipe. I adopted a simpler way to make the tart shell out of a dab of dough in the muffin pan. Of course they are not the best egg tarts I have ever eaten. But they are good enough for a sudden craving of egg tarts in a foreign land. Both the filling and tart shell have rooms for improvement. 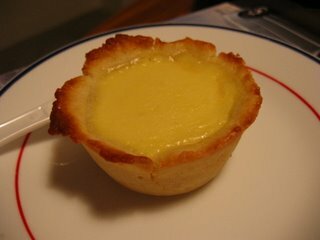 But the initial success gives me the assurance that I CAN make egg tarts too! Cook whipping cream and milk in a small saucepan until bubbles starts forming at edge but not boiling. Add sugar and stir until it dissolve completely. Remove from heat. Add to the eggs and yolk when the mixture has cool down. 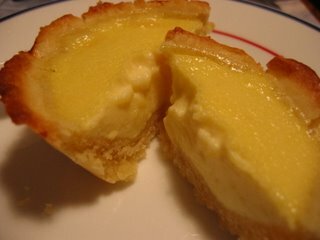 Sieve the egg custard mixture into a measuring cup and pour them into individual tart shells. Bake at 375F for 20 mins.